A great mini-alpine rock climb with moderate climbing and a cool summit. 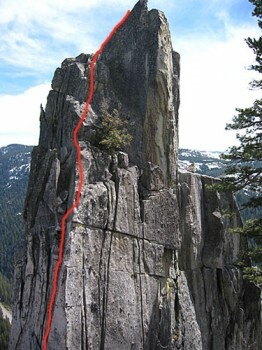 The crux is a steep but featured corner system off the ground followed by blocky 4th class climbing to a ridge traverse finale. Belay below the final ridge traverse on a big ledge. Shaded most of the day. Retreat by rappelling with one 60m rope down to the big ledge to the west and then rappel down Harrison Direct (if windy, manage the rope or it will snag).